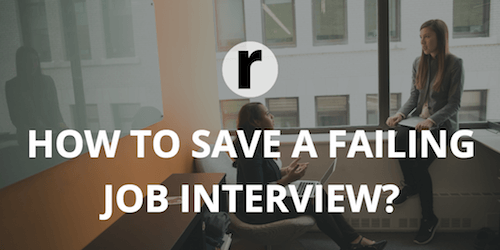 "Can I save an unsuccessful interview?" Yes. But if you notice that something went wrong during the conversation, and try to fix the situation in hot pursuit. Resumance is happy to share 7 tips to help you get out of a difficult situation during an interview. Excitement at the interview is a good sign. It says that you care about what is happening. In order not to make the impression of an incompetent candidate, you just need to calm down and accept your fear. Shady recruiter's behavior can be an imitation of a stressful interview. Potential employer wants to look at your behavior in an uncomfortable setting. So don't give up. If you're interested in a position, gather your thoughts and act. If the excitement is off scale, say directly, "I'm nervous." And explain why. For example: "I like your company so much ..." "I always worry about the interview ..." "I rarely attend interviews ..."
The experienced recruiter will help relieve tension, offer water, change the tone to a friendlier and so on. Seriously, just smile. Firstly, a smile relaxes the body and tends to a positive. Secondly, your interlocutor will involuntarily smile in response or soften your his expression, and this will make it a little easier. If you feel that you're sweating, your palpitations become more frequent, your lips are parched and it's hard to talk, ask for water. Say "Excuse me, please, can I have a glass of water?" My throat is dry." This is quite a natural request, there is nothing wrong with it. And, most likely, the recruiter will adequately respond to it. You will switch attention to how the recruiter goes for water. Take a couple of sips, relax and take the situation under control again. We're sometimes bombarded with questions, which makes it hard to think quickly. If at the interview something similar happened, tell the interviewer: "Can I ask a question?" And ask for something. The answer will allow you to relax and tune in to the right way. What question to ask at the interview? Any, but on the topic. For example: "In order to focus on the important things for a job in my story, can you tell me what are the most significant tasks for this post?" The question should assume a detailed answer, not just "yes" or "no". If you notice that the HR manager is nervous, bored or does not like your answers, ask him how the interview is going. For example: "Tell me, do I answer correctly? Maybe I need to concentrate on something else?" If you liked the office, you are a fan of the company's products, be sure to tell about it. It will be appropriate at the very beginning of the interview, when you just met with the recruiter. People love interesting stories. If you were asked a question that suggests a history answer, be sure to use this opportunity, start with the words "I'll tell you a story ...". Remember, there must be exposition, action, and resolution in it. Use humor. If after the interview you still feel that the efforts spent didn't make the situation better and the interview is unsuccessful, Resumance advises calling the recruiter or writing a letter. Thank him for his time. Note that although you made mistakes, you are a good specialist and can be useful to the company. Be friendly and ask for feedback.